Other friendly creatures in this lane have +0/+1. Summerset Shieldmage is a common Willpower creature card. It is part of the Core Set. "We must break through their ranks." 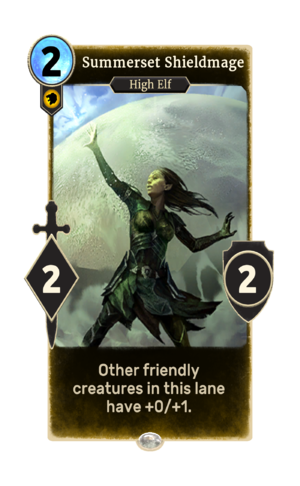 The card is named for the Summerset Isles. This page was last modified on 15 February 2019, at 12:20.